The Korea Times reports that Chinese historians are at it again in the leadup to October 1, “discovering” new sections of the Great Wall near the Korean border. This threatens to flare up the old (and never really extinguished) wars over Koguryo and Palhae kingdoms in the northeast. 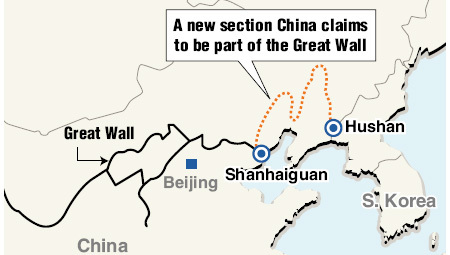 China has discovered a new section of the Great Wall that stretches to Hushan in Dandong, Liaoning Province, much further east than previously thought, according to Chinese media. Korean scholars, however, refuted this Tuesday, saying the discovery was made more than two decades ago and the new site is not part of the wall. “I saw the remains that China now claims to be a part of the Great Wall in Hushan when I was studying there between 1999 and 2000. It wasn’t made of bricks, unlike the rest of the wall,” said Nam Eui-hyeon, a history professor at Kangwon National University in Gangwon Province. Nam argued that the Chinese government built the new section, rather than discovering it. “Research by archeologists, proven by a committee of experts, discovered the eastern starting point of the wall at Tiger Mountain rather than Shanhaiguan, and we declare this finding to the world,” said Wu Guoqiang, secretary general of the China Great Wall Society. Experts here, however, say the declaration is part of China’s efforts to include the history of Korea’s ancient Goguryeo and Balhae Kingdoms as their own and claim the disputed territory with it, when the political situation of the peninsula becomes unstable due to the collapse of the North Korean regime. “Hushan was a neutral zone during the Qin and Min Dynasties when the Great Wall was built,” Nam said. Nam said the area did not belong to any nation, and the tribes there did not pay taxes to either of the two countries. He said that the wall was built over centuries as a defense against northern barbarian tribes, not the southern neighbor, Korea. China claims the wall stretched for more than 8,800 kilometers, much further than commonly cited estimates of 5,000 kilometers. Isn’t it interesting when China gets all infatuated with its own greatness? And note the trepidation about this is all a setup for when North Korea finally collapses. Keep an eye on The Marmot’s Hole; he has yet to post this story, but when he does, the comments are usually quite lively. That part of the wall is built by Korean ancient kingdom called ‘Goguryeo’ and ‘Balhae’. China should not say that the wall is part of great wall.